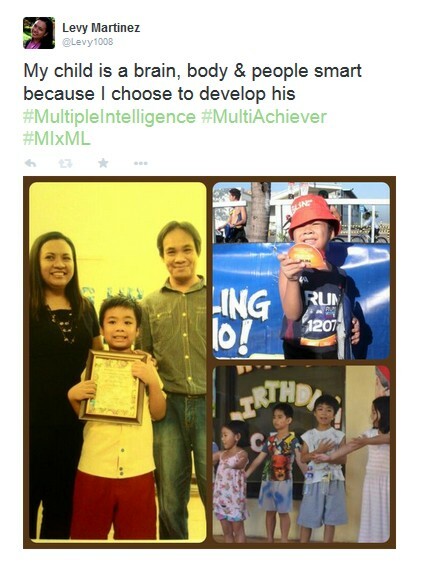 I would like to thank all the proud moms last month who shared their #MultiAchiever pictures on twitter. My son’s school always remind the parents that whatever the kids have accomplished, part of it is having supportive parents who are always there to guide them. Even the school knows their limit and that they can’t do everything for the well being of a kid and a big part of it still depends on what the parents do for their children. We need not only focus on our kids being a brain smart, but we also need to help them to be body smart and people smart. To be body smart, what I do with Ren is to give him the opportunity to be physically active. I let him join sports such as swimming, running and football. Being a people smart is a challenge for Ren but what I do to help him is to expose him more to events and give him tips on how to deal with people on certain situations. He is also undergoing social group sessions and I know that he will be people smart in no time. Now, it’s your time to tell and show me how your kids become multi-achievers. A participant can tweet multiple times but multiple tweets of one participant does not guarantee more chances of being chosen as one of the finalists. For picture/video posts that shows a child/children in it, he/she/they must be at least 4 years old. Entries with photos of children below 4 years old will be disqualified. In addition, photos must not include pregnant women. Done! Thank you mommy levy for this wonderful giveaway and belated happy mothers day! Thank you, Mommy Levy, for posting another fun contest! Just posted my entries on Twitter. We are working on the people smart category, Mommy Levy. We plan to join and organize more playdates this year. We also let our son join in our activities so he can meet our friends and co-workers. Challenging talaga kapag only child, e. Thanks for sharing. Great promo giving bonus to parents who nurture multiple intelligence. Though it may seem that multiple intelligence is inborn, it takes very dutiful parents who will continually support their kids to achieve their full potentials. good luck to all participants! This is a good prize for those kids who work hard in school. But i hope we parents must also not overlook to develop their emotional intelligence. I agree. That is why as I have mentioned we need not only focus on the kid’s brain intelligence but also on their body, and people intelligence. That is what Multiple Intelligence is all about. My 6 year-old Victoria Stephanie is consistent rank four in her class. Grade one representative for inter-school spelling bee. She is also a class officer (Teachers see some signs of leadership in her). She loves baking and cooking, so I let her join in cooking activities for kids. In one of the photos, she is decorating cookies. Being a body smart kid she loves running, jumping, and even joining Zumba with me.